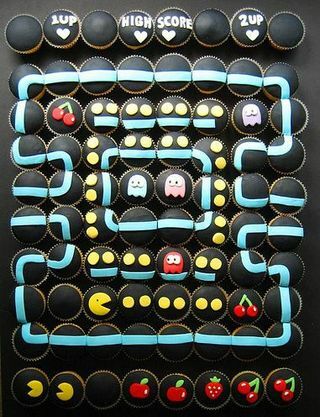 This is a really cool cake; simple but really neat. I have seen smaller cupcake designs before, but nothing which required this many cupcakes and so large. I suppose the neat thing is that if you wanted then you could move the pacman and the ghosts around. I would fear my daughter eating a cupcake, at least you could always let them have a cherry or a strawberry without damaging the design.